For centuries the centrepiece of many a stylish European party would have been a bowl of delicious fruit punch. Made with the wine of the country and luscious wine-saturated seasonal fruits the innocent-seeming punch was guaranteed to make the party go with a swing. Today you can find recipes for punches of every kind: hot, cold, red or white, while some are laced with a dash of spirits or given an added fizz with soda water. But the two most important ingredients are the wine and the fruit. Don’t rummage in the cellar for your prized bottle of Chateau Lafite but don’t make do with the cheapest bottle at Lidl either. A punch will only be as good as the wine you choose to make it from. Even though it’s going to have extra ingredients added, it won’t improve miraculously if it’s only fit for vinegar-making to start with. Today any colour goes! While the wine punch or sangria so beloved of holiday-makers in Spain is traditionally red there’s no reason why it has to be. Red, white or pink, it’s your choice! Spanish Rioja makes a great base for a fruity summery red wine punch, while a rich Cabernet Sauvignon would be ideal for a hot mulled winter punch. White wines create a fresher, cooler-looking punch, terrific for a hot summer’s day. Chenin Blanc and Chardonnay both have fruity overtones making them perfect starters for a white wine punch. Sauvignon Blanc, on the other hand, will give you an alternative herby flavour. A nice German Riesling is another popular choice. 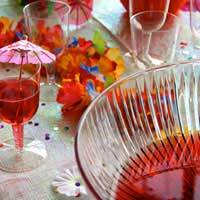 The pink blush of rosé wine adds a delightfully light touch and a fruity flavour to a bowl of summer punch. And rosé wine isn’t necessarily sweet; opt for a dryer variant if you prefer. Open a bottle of your favourite wine and have a tasting session. Does its aroma remind you of any fruits? Sip it slowly and savour its flavour; again are you picking up any fruity tastes? If you are then the wine will be perfect for your own punch creation. Then again, if you can’t get that scent of lychees blooming in the midday sun, open another bottle and try again! Once you’ve found the perfect wine, choose the fruits to go with it. If you can’t get fresh fruits in season, frozen ones make a fine substitute. Remember that the punch should look good enough to eat as well as taste good so choose the fruits carefully for appearance as well as flavour. Blueberries and cranberries give a wonderful wintry feel; lemons, melons and apples say fresh and light. Wash or peel and dice or slice and add to the large bowl into which you’ve already poured your wine. Allow to stand for some time before drinking to let the fruit absorb the wine. Chill the wine before making the punch for a refreshing summer drink. Ice added to the punch will dilute the strength so, if you prefer, stand the jug or bowl in a larger dish filled with ice to keep it cool. A tot or two of a spirit - often brandy, fruit-flavoured or otherwise - will give your punch an extra kick. Once again choose a spirit that will complement the flavours already present. The age-old trick - of students in particular – of adding a glass of this or a bottle of that isn’t to be encouraged! Not unless you want your punch to end up undrinkable or lethal! Add extra fizz in the shape of champagne or sparkling wine, soda water, tonic water or lemonade. Taste as you mix to get the perfect punch. Pour from a decorative ceramic or glass jug, or ladle out of a wide bowl. Provide cocktail sticks to stab the fruit – it’s meant to be enjoyed not left in the glass! Which Wines for a Summer BBQ?